ROME, NOV. 15, 2006 (Zenit.org).- The archpriest of one of the best-preserved historical centers of Sicily thinks that "the first thing that any parish should engage in is perpetual Eucharistic Adoration." Monsignor Michele Placido Giordano, archpriest of Mistretta, has always promoted this type of prayer. In fact, the Church of the Most Holy Savior, in Mistretta, is one of only a handful of churches in Italy that has perpetual Eucharistic adoration. On Nov. 9, Benedict XVI urged a rediscovery of this practice, when he met with participants in the plenary assembly of the Pontifical Committee for the International Eucharistic Congresses. In this interview, Monsignor Giordano talked about Eucharistic adoration. Q: Why did you decide at a certain time in your community, which is not very large but is vibrant, to begin perpetual adoration? Monsignor Giordano: I believe that the first thing that parishes must do is to teach how to pray. Therefore, it is a basic choice, a pillar that sustains everything. Having made this choice, [I find that] the path is marked out: The people must be given the space where they can encounter themselves. I was affected when I went around and saw Christians who were going to Buddhist schools of meditation. Then I reflected on the fact that we Catholics did not do enough to teach people to pray. So I began to promote Eucharistic adoration every week; then every month, prolonged to midnight; on certain occasions the whole day, until we came to the decision, as a gift of Mary right after the Jubilee, to engage in perpetual adoration. We began on December 13, 2004, precisely on the 17th centenary of St. Lucy. Since then, perpetual Eucharistic adoration has been under way, night and day, which now continues on its own. Q: Some say that an hour of adoration every now and then is hard work, therefore no thought is given to the possibility of perpetual adoration. Monsignor Giordano: In Mistretta there was also perplexity in the beginning; now the conviction of the people is absolute. One sees that it is Jesus who leads the community. One must have courage. What is important is to begin. When actions are carried out in Jesus' name and for him, he then carries them forward. One must have faith. The ways in which works are realized are the most mysterious. At times, as archpriest, I would like to ask the community for something more, but I don't have the courage; then, it happens that those who go to adoration return with more abundant resources than I could have imagined. There was a time, for example, when I wanted to close the TeleMistretta television station because I was unable to guarantee the budget. Then a woman of the parish told me not to close it and to trust in the Lord. Sixteen years have gone by since then and the means have always arrived. Q: What is the minimum number of people needed to ensure perpetual adoration, and how does it unfold? Monsignor Giordano: At least 24 people are needed during the day to ensure perpetual adoration; one every hour, 168 a week. Obviously it can be the same people who rotate. We have structured it in four schedules of six hours. There is a captain for every hour who is responsible and who finds solutions when, for different reasons, someone is missing. During the day, the church where adoration takes place is almost always full. During the night, adoration takes on a special attraction; it is intimate and very beautiful. I see many youths who retire to talk with Jesus. There are 14 churches that have Eucharistic adoration in Italy, two in Sicily. It is an experience that I recommend to all dioceses and parishes. Q: What are the fruits of this intensive prayer activity? Monsignor Giordano: Very many. Now we are about to publish a book with the testimonies of a year of Eucharistic adoration. There are very many graces. A girl had decided to abort; we prayed and convinced her not to do so. Then, her will began to weaken. We returned to the church to pray and in the end the child was born: He is called Carlo and he and his mother are now supported by the Gemma Project. Monsignor Ignazio Zambito, bishop of Patti, asked us to pray for vocations at the beginning of adoration. We prayed a lot and the seminary of the Diocese of Patti, which had six seminarians, this year has an additional nine candidates to the priesthood. Q: Many say there is no time to engage in adoration, that there are many things to do in the parish. Monsignor Giordano: It is not the case that in engaging in adoration we neglect other activities. We do more. 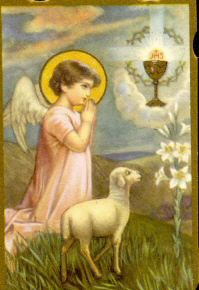 Adoration makes many and more beneficial activities germinate. In our diocese, for example, along with adoration a new youth center is being launched and now we are on the verge of relaunching the diocesan radio station. All this benefits much from adoration. Adoration is the root of the plant that, the more prayer it has, the more it grows and develops. We must allow the root to expand. Moreover, prayer gives us the strength and inspiration for the most important ecclesial commitments, those of the defense of life and of the family. H/T to Dean who finds the most interesting things to post. Mahalo Dean! May you go on a diet of crunchy, unsweetened locusts, thou lazy Babylonian! you, at least, love Him and keep your heart quite pure for Him. Oh! If you only knew how the good God loves pure hearts! It is there that He loves to reign. ROME, NOV. 10, 2006 (Zenit.org).- Here is a translation of a commentary by the Pontifical Household preacher, Capuchin Father Raniero Cantalamessa, on the readings from this Sunday's liturgy. One day, Jesus was standing before the temple treasury, watching people deposit their offerings. He saw a poor widow come and put in all she had, two copper coins, which make a penny. He turned to his disciples and said, "Truly I say to you, this poor widow has put in more than the others. All have given from their excess, but she, in her poverty, put in all she had, all she had to live on." We might call this Sunday the "Sunday of the widows." The story of a widow was also told in the first reading, the widow of Zarephath who gave up all she had left to eat (a handful of flour and a drop of oil) to prepare a meal for the prophet Elijah. This is a good occasion in which to turn our attention toward both the widows and the widowers of today. If the Bible speaks so often of widows and never of widowers it is because in ancient society the woman who was left alone was at a greater disadvantage than the man who was left alone. Today there is no longer this difference. Actually, in general it now seems that women who are alone manage much better than men. On this occasion I would like to treat a theme that is of definite interest not only to widows and widowers but also to all those who are married, especially during this month in which we remember the dead. Does the death of a husband or wife, which brings about the legal end of a marriage, also bring with it the total end of communion between the two persons? Does something of that bond which so strongly united two persons on earth remain in heaven, or will all be forgotten once we have crossed the threshold into eternal life? One day, some Sadducees presented Jesus with the unlikely case of a woman who was successively the wife of seven brothers, asking him whose wife she would be after the resurrection. Jesus answered: "When they rise from the dead they will neither marry nor be given in marriage but will be like angels in heaven" (Mark 12:25). Interpreting this saying of Jesus wrongly, some have claimed that marriage will have no follow-up in heaven. But with his reply Jesus is rejecting the caricature the Sadducees presented of heaven, as if it were going to be a simple continuation of the earthly relationship of the spouses. Jesus does not exclude the possibility that they might rediscover in God the bond that united them on earth. According to this vision, marriage does not come to a complete end at death but is transfigured, spiritualized, freed from the limits that mark life on earth, as also the ties between parents and children or between friends will not be forgotten. In a preface for the dead the liturgy proclaims: "Life is transformed, not taken away." Even marriage, which is part of life, will be transfigured, not nullified. But what about those who have had a negative experience of earthly marriage, an experience of misunderstanding and suffering? Should not this idea that the marital bond will not break at death be for them, rather than a consolation, a reason for fear? No, for in the passage from time to eternity the good remains and evil falls away. The love that united them, perhaps for only a brief time, remains; defects, misunderstandings, suffering that they inflicted on each other, will fall away. Indeed, this very suffering, accepted with faith, will be transformed into glory. Many spouses will experience true love for each other only when they will be reunited "in God," and with this love there will be the joy and fullness of the union that they did not know on earth. In God all will be understood, all will be excused, all will be forgiven. Some will ask of course about those who have been legitimately married to different people, widowers and widows who have remarried. 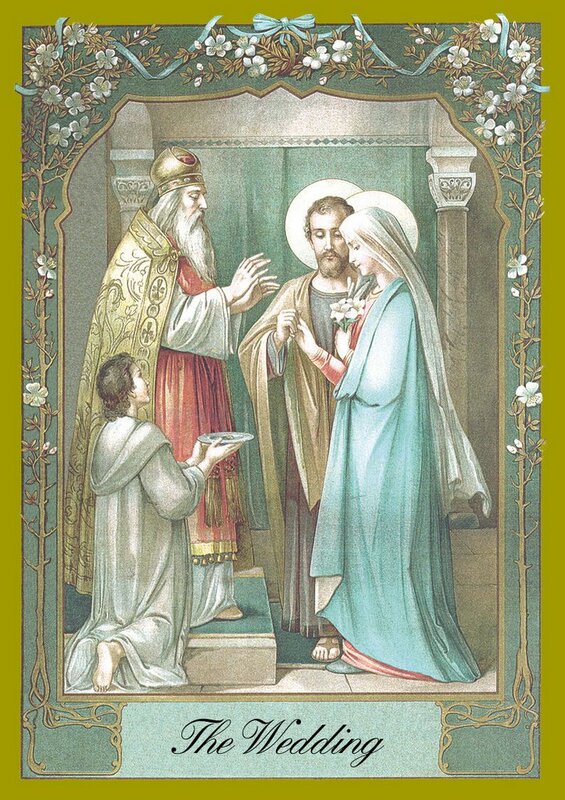 (This was the case presented to Jesus of the seven brothers who successively had the same woman as their wife.) Even for them we must repeat the same thing: That which was truly love and self-surrender between each of the husbands or wives, being objectively a good coming from God, will not be dissolved. In heaven there will not be rivalry in love or jealousy. These things do not belong to true love but to the intrinsic limits of the creature. If you look in the Catholic Dictionary, you will find a very long definition for the word tradition. What does the above definition have to do with Hawaiian basket weaving? 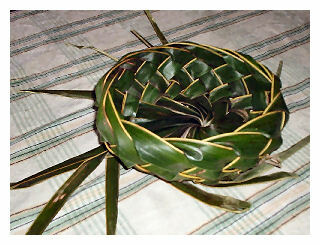 We have a neighbor who graciously offered to teach a couple of us moms and our sons how to weave baskets out of palm fronds. So a total of six of us met yesterday afternoon, equipped with knives, cutting shears, palm fronds and Charlie our kapuna. 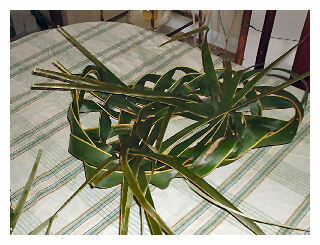 We were first taught which palm fronds to collect or pick. Charlie told us which were the ones that were good for basket weaving without hurting the tree. In the Hawaiian culture, you respect nature. I should tell you that Charlie is not a native Hawaiian. However, he grew up on the big island with native Hawaiians. There he and the other keiki learned this skill. 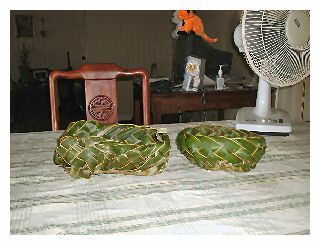 Then we prepared the palm fronds. The palm fronds we used yesterday came from ones that were trimmed from local palm trees by professional tree trimmers. These fronds had to cure a few days in order to be pliable enough to work on. We trimmed the fronds for use and then Charlie told us that he would teach us with the understanding, that once we learned this skill, we in turn would teach others. So first he taught my friend while the rest of us prepared our fronds for weaving. He then taught me. It was interesting to note that the way we weave these palm fronds is go towards the natural flow of the palm itself. Charlie then told us he would not be teaching the boys....actually, three young men...instead, we as their mothers, would teach our sons this skill. In that way, the tradition is passed on from one family member to another. He also expects our sons, in turn to teach their children. So you see, the connection between tradition and basket weaving. This got me to thinking about the Catholic Church. 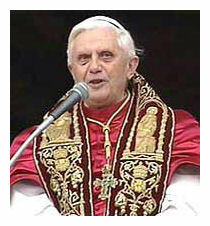 The church is based on Jesus' teachings in Scripture but tradition also plays an important part in what the Church is. So when the Church is criticized for what some say is relying too much on tradition, that isn't necessarily a bad thing. If you think about it, tradition is a very important concept in all cultures, and the Church's tradition, came from Jesus and the men who knew Jesus very intimately.